The idea behind poke cake is nothing short of brilliant. Cake becomes extra moist and studded with flavor when dotted with a zillion tiny holes that are destined to be filled with liquid Jello, or, in this case, rich, eggnog custard. I decided poke cake needed a makeover. A slightly less packaged, slightly more festive makeover. I made this cake (not from a box) and doused it with custard (not from a box) and then covered the entire pan with whipped cream (also not from a box). These were all very good decisions. Let's talk about this cake. I wanted an airy cake for this recipe, one with lots of little nooks and crannies for the eggnog custard to fill. For that reason, I chose vegetable oil as my fat and whipped egg whites to stiff peaks to further lighten the batter. The result is a light but sturdy vanilla cake, not unlike the texture of a boxed cake. Next came the eggnog custard. I did not make my own eggnog for this cake, but I am sure that would be fantastic. I just thickened a little store-bought eggnog with some egg yolks and kicked it up a notch with a splash of golden rum. While the custard was still hot and fairly runny, I poured it over the dotted cake. After about two hours in the refrigerator, the custard had set and settled into the cake. A layer of rum-scented whipped cream and a sprinkling of gold sugar, white chocolate, and nutmeg completed the scene. This dessert only gets better as it sits so feel free to make it a day in advance. I love this cake because it is so wintry and beautiful, but way less finicky than a layer cake. 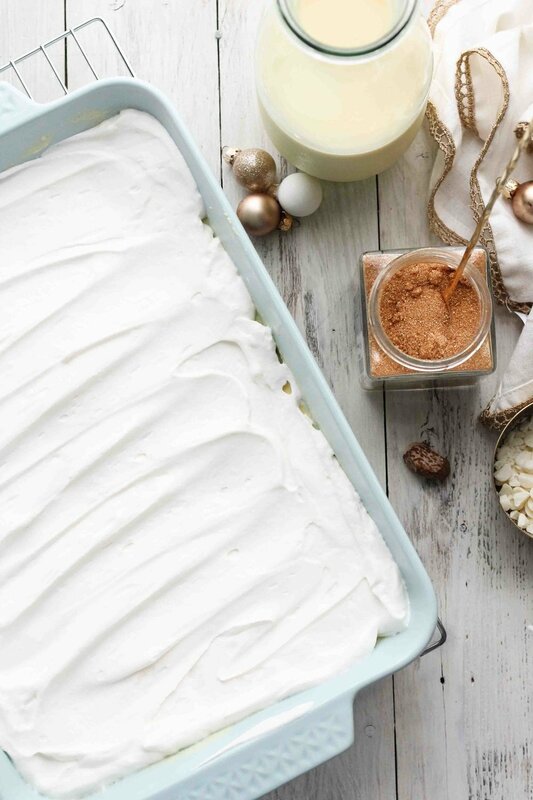 Is eggnog with eggnog cake too much? Come on, you know you want a slice. Preheat oven to 350 degrees. Coat a 9x13 pan with nonstick spray. Separate eggs. Beat the egg whites in a medium bowl until stiff peaks form. Combine flour, baking powder, and salt in a large bowl and whisk to combine. In a separate bowl, whisk together oil, sugar, and egg yolks. Pour the egg yolk mixture into the dry ingredients and whisk to combine. The batter will appear to be too thick but this is just as it should be. Whisk in half of the beaten egg whites to loosen the batter, then gently fold in the second half of the whites. Cook's Note: The goal here is to first loosen the batter with a portion of the egg whites, then aerate the batter by very gently folding in the remaining whites. The final batter should be very light, with tiny bits of beaten egg whites scattered throughout. Pour the batter into the prepared pan and bake for 25-30 minutes; until puffed and lightly browned. Transfer the pan to a cooling rack and allow the cake to cool completely. Once the cake has cooled, use a skewer to generously dot the cake with holes. Heat the eggnog in a small saucepan over medium heat until steaming. 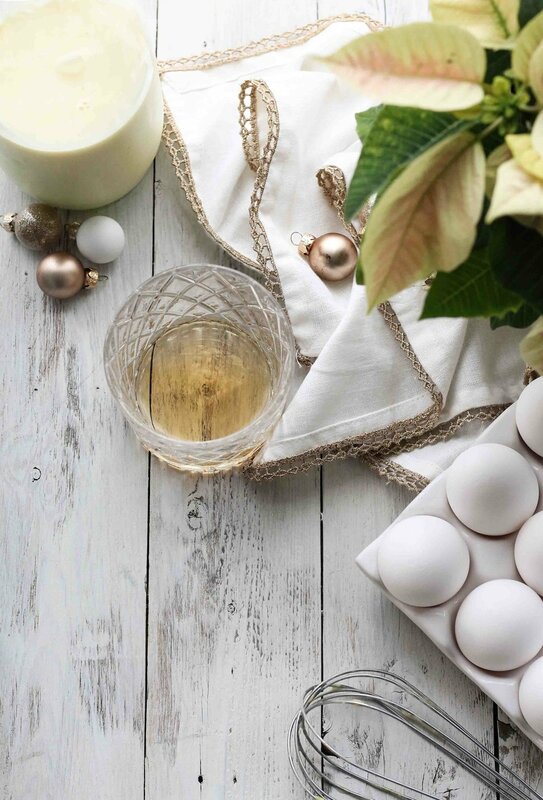 While the eggnog is warming, whisk the egg yolks and heavy cream in a medium mixing bowl. Slowly ladle about half of the steaming eggnog into the egg yolk mixture, whisking constantly to slowly warm the egg yolks. Pour the tempered egg yolks into the saucepan and cook, whisking constantly, until thickened. This should take about 3 minutes. In the last minute of cooking, whisk in the rum. Pour the custard over the dotted cake, using a spatula to evenly spread the custard over the surface. Cover with plastic wrap and refrigerate for at least two hours. After two hours, nearly all of the custard should have seeped into the cake. Combine heavy cream, extract, and confectioner's sugar in a large mixing bowl and beat with an electric mixer until soft peaks form. Spread the whipped cream evenly over the surface of the chilled cake and sprinkle with white chocolate, nutmeg, and gold sugar. Cover with plastic wrap and refrigerate until ready to serve or up to 24 hours. Enjoy! Cook's Note: This cake is best served cold.